Are you looking for a focus to develop your jewellery skills this year? Working to a given brief can really help to explore ideas and techniques in jewellery making, and this can lead to huge leaps in your practice. This year Lithuania celebrates the 100th anniversary of the restoration of independence. The theme for the Amber Trip Art Jewellery Contest 2018 focusses on freedom in it’s broadest sense. And the organisers of the International Baltic Jewellery Show invite you to participate…. Read On! 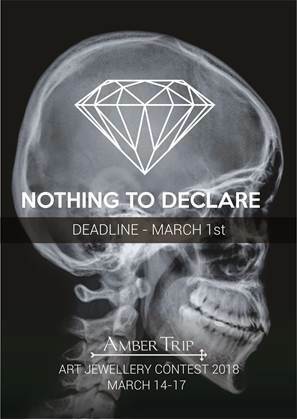 „Amber Trip” invites Flux Jewellery School’s students to participate in Art Jewellery Contest – celebrating freedom, „Nothing to Declare”, which will take place during XV International Baltic Amber and Jewellery Fair „Amber Trip” 2018, in Vilnius, Lithuania, March 14-17. Art Jewellery Competition accompanying the Amber Trip 2018 International Baltic Amber & Jewellery fair in Vilnius (Lithuania) will take place during 14-17 of March 2018. This year‘s theme is „Nothing to declare“. 2018 is a special year for Lithuania as this year the country celebrates its 100th anniversary of the restoration of independence. A hundred years ago we became independent. We have enjoyed human rights and freedoms for a hundred years. We have been choosing what we consider to be right and feel responsible for our own choice. In other words, we live like free people. We can travel in any direction and return to Lithuania, although Lithuania belonged to another state not so long ago. The iron curtain was an almost impossible obstacle for us. All our dreams to see another, free world rebounded from it. To survive today‘s day, we had to overcome a number of ideological and bureaucratic barriers. To return home, we had to shake out our suitcases during customs checks. But now, at the airport, we are quietly passing through the gate named „Nothing to declare“. We have nothing to hide, we have nothing to declare. We can only declare our freedom, and we are grateful for this opportunity to the signatories who signed the Declaration of Independence a hundred years ago. The jewellery art competition “Nothing to declare” invites artists to announce their freedom in the language of jewellery, to say loudly that we have nothing to declare or hide. On the other hand, we can declare our freedom, freedom to travel and stay in our homeland, freedom of thought and freedom to disagree with others, freedom of being ourselves, freedom of being an artist and freedom from the idea of Independence. Because we have gained such a right. “Nothing to declare” means justice and the possibility of passing through any inspectors with no fear (it is not by accident that we can also see the representative of the Customs of RL among the members of jury), but above all, the whole set of possibilities. We offer the opportunity to present this by using the metal art. Amber in the contest is a welcome but not obligatory material. All participating works will be touring in exhibitions and jewellery shows in Europe, after the „Amber Trip“ International Baltic Amber and Jewellery fair . Art jewellery and applications are accepted till the 1st of March. Please contact art@ambertrip.com for participation conditions and further details. If you’d like to participate, please email us for the application form.